As you likely know, I’m a big fan of Michael Horowitz. I think he has routinely discovered key aspects of DOJ and FBI’s behavior that needs improvement. I think he has stood up to FBI pushback reasonably well, if not always successfully. That other professional IGs look to him as their leader reflects the great respect he has earned among his peers. I’ve already mentioned, in passing, that I think Horowitz’ treatment of the NY field office leaks in the IG Report on the Hillary investigation to be really problematic. The report, and the Andrew McCabe report before it, makes it very clear the rampant leaking from NY motivated a lot of the defensive behavior at FBI and DOJ (not to mention the decision to take an overt act in advance of the election in violation of standing policy). Among other passages, the report cites this very long response (it starts on report page 385 if you want to read the whole thing) from Loretta Lynch, describing how much hatred towards Hillary there was in NY. I said, but this has become a problem. And he said, and he said to me that it had become clear to him, he didn’t say over the course of what investigation or whatever, he said it’s clear to me that there is a cadre of senior people in New York who have a deep and visceral hatred of Secretary Clinton. And he said it is, it is deep. It’s, and he said, he said it was surprising to him or stunning to him. You know, I didn’t get the impression he was agreeing with it at all, by the way. But he was saying it did exist, and it was hard to manage because these were agents that were very, very senior, or had even had timed out and were staying on, and therefore did not really feel under pressure from headquarters or anything to that effect. And I said, you know, I’m aware of that…. I said, I wasn’t aware it was to this level and this depth that you’re talking about, but I said I’m sad to say that that does not surprise me. And he made a comment about, you know, you understand that. A lot of people don’t understand that. You, you get that issue. I said, I get that issue. I said I’m, I’m just troubled that this issue, meaning the, the New York agent issue and leaks, I am just troubled that this issue has put us where we are today with respect to this laptop. The report makes clear that the NY leaks played a key role in Comey’s disastrous decision to announce the reopening of the investigation into Hillary. Comey denied that a fear of leaks influenced his decision to send the October 28 letter to Congress. However, other witnesses told us that a concern about leaks played a role in the decision. As Baker stated, “We were quite confident that…. [I]f we don’t put out a letter, somebody is going to leak it. That definitely was discussed….” Numerous witnesses connected this concern about leaks specifically to NYO and told us that FBI leadership suspected that FBI personnel in NYO were responsible for leaks of information in other matters. Even accepting Comey’s assertion that leaks played no role in his decision, we found that, at a minimum, a fear of leaks influenced the thinking of those who were advising him. In spite of the magnitude that these leaks had, Horowitz did not seize the FBI phones of the presumed leakers to find out what kind of damning texts they sent among themselves. This is a point made by NYCSouthpaw in a thread the day the report came out. The asymmetric focus on bias against Trump and not against Hillary is a real problem with this report. I’m sympathetic with the IG’s explanations for why it didn’t find the source of leaks and hopeful by its promise to follow up. Against this backdrop, and as noted at the time the OIG announced this review, we examined allegations that Department and FBI employees improperly disclosed non-public information. We focused, in particular, on the April/May and October 2016 time periods. We have profound concerns about the volume and extent of unauthorized media contacts by FBI personnel that we have uncovered during our review. Our ability to identify individuals who have improperly disclosed non-public information is often hampered by two significant factors. First, we frequently find that the universe of Department and FBI employees who had access to sensitive information that has been leaked is substantial, often involving dozens, and in some instances, more than 100 people. We recognize that this is a challenging issue, because keeping information too closely held can harm an investigation and the supervision of it. Nevertheless, we think the Department and the FBI need to consider whether there is a better way to appropriately control the dissemination of sensitive information. Though I would like more details about what the IG discovered when it tried to chase down FBI leaks. We know they grilled McCabe (and discovered the source of one leak that damaged Hillary). Who else did they grill, and how many were in NY? But here’s the part I find totally irresponsible. This is, of course, one of the totally decontextualized link analyses the IG includes in the report to substantiate its claim that the FBI leaks like a sieve. By context, this one (of two) probably reflects communications from October, a period we know (from the McCabe report) that DOJ investigated heavily, based in part off an effort to identify Devlin Barrett’s sources and those of other journalists who created a panic right before the election. The IG has gone through the effort to identify (between the two link analyses, assuming no overlap of journalists, though I suspect there may be some) the FBI sources for seven different journalists. At least the two or three journalists with more sources likely recognize they’ve been burned, as might their sources. But the IG released these two link analyses without telling us information that it surely knows. That is: how many members of these clusters were sitting in NY, and how many in DC? Is the prolific one here Barrett (which is virtually the only way the IG would be able to claim there were too many calls to ID sources for a story we know they examined closely)? If so, then the IG already knows whether it’s true that NY started leaking about both the Weiner emails and the Clinton Foundation investigation with the purpose of pressuring DC to make certain decisions. That is, having done this analysis, the IG knows the answer to a critical question: did leakers in NY have a significant role in forcing decisions that played a key role the outcome of the election? If most of these leakers are in NY, then the answer is clear. But the IG didn’t tell us that information. Worse still, by withholding this information, the IG allowed these two pages to be used (as released) out of context. They were waved around on TV all morning, with the clear suggestion that each of these leaks reflected someone trying to do in Trump. But the reality is possibly (likely even!) precisely the opposite — that a good chunk of these leakers were trying to help Trump. And they may well have succeeded. Michael Horowitz owes us at least that context. And I hope Democrats on the Senate Judiciary Committee demand that answer when Michael Horowitz shows up to testify. Update: One more question I’ve got — how DOJ IG decided to stop the analysis at October, and not at the election. After all, the most damaging fake news story of the election, IMO, was the false leak to Bret Baier, attributed to “two sources inside the FBI,” that Hillary was going to be indicted. I’m not holding my breath for a follow-up report, but as you say, Congress may be able to get more info. The Thought Experiment that I keep doing is this: What would have happened if Comey had followed protocol and kept his mouth shut? (I won’t even bother with: What if the FBI had quietly analyzed the e-mails on the laptop as soon as they got them in late September?) We know that the NY office was leaking in an attempt to force the existence of the laptop e-mails to become public. Devin Nunes has already said that they were leaking the info to him in late September. Giuliani was probably getting leaks, too. Throw in multiple journalists, and you’ve got a story that’s almost certainly going to come out prior to the election. Would a New York Times or WaPo (or both) story about the e-mails have knee-capped Clinton as much as Comey did? My guess is no, but I still can’t imagine ANY realistic scenario under which the existence of the e-mails DIDN’T come out right before the election. Nunes would’ve probably gone on record saying that he’d be told by multiple FBI agents that the story was true. I think that this cadre of FBI agents was going to make sure that the information got out one way or another. I don’t think that this in any way excuses Comey’s behavior, but if he’d followed the rules, we’d very likely know who these other actors are by now. Nunes sees Rock and Hard Place. The infamous NY Times Halloween 2016 article about FBI sources saying Trump had no clear link to Russia suggests you’re right. Of course, that level of skepticism never made it into the reporting on Clinton, and at least a bit of that is Comey’s fault. I’m lonely in this opinion, but I actually think the best explanation is not at all what Dems want to make about it. Sorry, I’m not quite following — can you expand a bit? I’d be interested in a different take than mine. The big thing that surprised me in the last two paragraphs that you quoted was that “dozens” of FBI agents had contact with members of the media, and many were taking what most of us would describe as “bribes”. As someone who’s gone through multiple rounds of “Conflict of Interest (COI)” training in academia, this is just jaw-dropping to me. Hard to guess, but a couple possibilities obtain. One, the IG investigating may have gotten access to the comms records and/or media contact info from the various agents under something akin to a Garrity v. New Jersey https://en.wikipedia.org/wiki/Garrity_v._New_Jersey waiver rule, i.e., anything you say cannot be used to (a) prosecute you or (b) discipline you vis-a-vis your federal employment (either under the Hatch Act, for violating FBI media-contact regs or policy, or some other way). It’s a given that cops generally, and especially FBI types in particular, know exactly what their rights under Miranda, Garrity, etc. are and are the loudest and most expansive on this planet when it comes to invoking them in their own favor. Secondly, it’s not outside the realm of possibility that while in interviewing the respective FBI-affiliated individuals that the IG either ran into such a stone wall of silence and/or got massive overcompliance yielding a Biblical flood of contacts (the better to bury the contacts the IG was interested in) that IG threw their hands up in exasperation at untangling the massive number of comms. In either case, it could be that the IG resorted to parallel-constructing and maybe used technical means (like network analysis of phone metadata, pen-registers, etc.) which allowed them to come up with the diagrams. 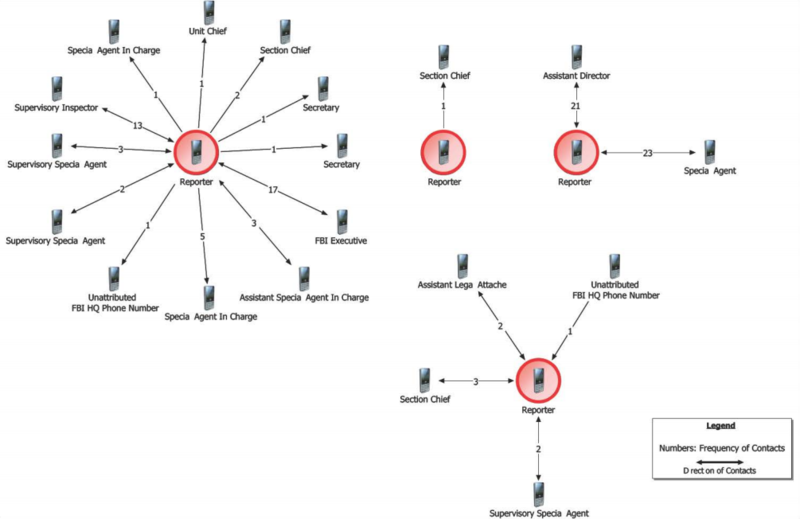 Of course, the results of such network analysis would not include the content of those calls, which just as easily could have been “stop calling me, dammit” (and doubtless the agent(s) involved might claim that). Third, being an FBI agent is a high-status job in NYC and surroundings, and they get no end of jock-sniffing from the media and more. Going down to DC for an example differing only in degree and not kind, if whatshername-Brenda-Starr-Junior was willing to bed the head of security at the Intel Committee – old enough to be her father and not too handsome – and then publish his pillowtalk across the pages of the NYT, the same kind of sucking up to FBI agents in NYC would surely have gone on. It’s also not outside the realm of “very likely” that people in NYC would be working their own agendas (as to things which might, or might not include HRC, DJT or both) in contacting the agent. Bringing an agent to a party would imbue the person doing the bringing with the aura of having the FBI on his side, at least as to the other party guests (who would inevitably find out or know that guy was FBI). Moreover, the agents could easily excuse their socializing as one way of developing “intel”, prospecting for “sources” and “developing context”, given the breadth of international stuff which goes on there. Keep in mind one of the roots from which the current potboiler surrounding DJT sprang was his lifelong business dealings in NYC and, later, internationally. Fourth, maybe the IG is biased for or against HRC, DJT or both. Marcy, you linked to the buzzfeed twitter thread about the overheard phone call. One person who knows who was leaking is Comey. But Comey embarked on this “Save the FBI at any cost” analysis and reopened the case, then wrote the letter and went mum on how Giuliani and the gang played into his decision. If you are going to criticize Comey’s actions, but not the catalyst behind it, then the report is disingenuous. Comey knows someone who knows which agents leaked. He should come clean. No way Comey can say anything at this time. He could tip and blow an investigation. It appears that Comey was so smitten with himself and obsessed with proving his virtue that insubordination by his people didn’t bother him enough to do something about it. It takes a heaping does of obtuseness to think you’re protection the FBI when the actual result is the opposite: a shredding of that institution’s credibility. And while it’s too late now, Comey might want to ask Mueller what to do when agents pursue political agendas. I would imagine that some of this off-the-books interaction between FBI and reporters was case related: getting, checking and vetting leads and informants, and keeping tabs on who’s who in a town obsessed with status and legally marginal conduct to get it and keep it. It would not all have been typical business schmoozing, thank yous or preludes to contracts and exchanges of money. my consistent take on comey is and was that he was a bureaucratic chief who was protecting himself and his fiefdom from republican congresscritters. this viewpoint involving well-known bureaucratic behaviors never shows up in any discussion of comey’s thinking or motives so i may have been wrong, but remain unconvinced absent a good counterargument. i have acquired another viewpoint though in the last several months of directorbcomey’s public commentary and the ig’s criticism. while i’ll give him savvy, i’ve come to think that comey is just not very bright. i mean that literally. Avannatti outs Stephen Miller “in your fascist zeal you . .”. Another very insightful, illuminating and detailed post Marcy. Thanks. Wish MSM would do this kind of diligence. I can’t help wondering source of (seemingly) so many NY Field Office agents pro Trump attitudes: genuine and for what reasons, or simply visceral anti Hillary? To this day I never thought her private email server was that big a deal, seems like almost everyone in government has been doing this for a long time. As aside, wrt subject of this article: I suspect if this does get MSM exposure the media Trump psychofants will spin NY Field office leaks not as you describe, rather cite anti-Hillary sentiment as more reason that the “Good FBI agents” further demand more investigation (prosecution?) into Hillary’s email server. Those ‘good fbi agents’ that Rudy believes only exist in NY, but not DC, right? The so-called “good agents” that leaked to Noonces very definitely had a dislike for their former NY Senator, who among other imagined sins was likely considered to be an Arkansas carpetbagger (I recall the NY Times also saying as much at the time she ran for US Senate). It’s not a trivial thing, I used to work with two friends who were from different parts of NYC, and the easiest way to get a show going would be to ask who was the real New Yorker. Small sample, for sure, but an indicator nonetheless. The FBI has salvaged work and personal emails thought to have been deleted from the private server Hillary Clinton used while she was secretary of state, Bloomberg first reported Tuesday night. The NY FBI office consisted of some compadres of Giuliani. Who, BTW, made an investigation into Trump disappear in or around the 80s. You decided to pick a chicken, when it might have been an egg, hatched long ago. The briefcase full of cash, 1988. Shortly after Lombardi approached him, Trump announced that he’d raise $2 million “in half an hour” if Giulianni ran for mayor. He later channeled $41,000 into the future mayor’s 1989 campaign. “September 2, 2016: On September 2, 2016, Page and Strzok exchanged the following text messages. The sender of each message is identified after the timestamp. Where in that thread is the grand conspiracy? Ha ha, too funny. Orders of magnitude funny. I feel sorry for you if you’re serious. What’s funny? That the fix was in for Trump? That’s HI-larious. And again, you immediately resort to some lame attempt at insults. It’s your MO. Silly, silly boy, and testy too. Fixated on Trump’s malignancy you are so blind to corruption in our government you can’t see it even when you “trip” over it. oh come on lefty. you have been at this crap for years. the kindest thing that can be said of you with respect to your obsessive denigration of anything to do with any aspect of the democratic party is that you are an obsessive anti-clinton fanatic to whom no piece of political gossip or invented scandal is too absurd or patently false for you to credulously repeat. tell us again, lefty, as you have several times before, the republican propaganda tale about how clinton sold the u. s. uranium to the russians. for an otherwise sharp guy you sure have turned into a crackpot. Funny, I was talking about corruption at the FBI and DOJ. Curious you conflated them with the Democratic Party. You’re every bit as silly as trip (over his own crank). Hey, Bill took $500k cash from the Russians, got a photo op yukking it up with Putin, and the Clinton Foundation got $145M from benefactors of the uranium deal. Fact, not propaganda of any stripe. Thanks so much for reminding folks of that little piece of Clinton greed, corruption and selling out our country. Imagine if that had been Trump, the squealing to high heaven about collusion with the Ruskies wouldn’t have stopped. I tend not to poke at the Repubs because they’re beyond hope. I keep hoping the Dems will find their way and reform. That’s where there is hope for the country and why it is worth poking at them to help them see the error of their ways. First step towards recovery is for folks like you and trip (over his own crank) to get over Hillary and Russia hysteria. I’m not holding my breath, but I am holding onto my hopes that you will eventually come to your senses. Until then have a nice day goofball. You didn’t even bother to read what I left for you. You quickly dismissed the story with “Trump is a jerk, BUT..”. However, the story was about Giuliani and the FBI killing an investigation into Trump, and that is the subject; The FBI. There was a history of both Giuliani and the NY FBI carrying water for Trump. That means that the FBI who may have been leaking during the campaign may have had strong loyalties, versus this upstanding “being pissed off” because of Page and Strzok. You seem to be projecting your own psychological disposition. Your incessant focus on, and irrational one trick pony comments almost exclusively about your hatred of the Democrats makes you utterly blind to both the history and current day machinations of Trump and his gang. Of course I know about corruption in government and both sides, including your precious Stein. You think you’re some kind of special intellect where no one but you “gets it”, here. And that is your position. People who disagree with you, or try to make you aware, you take offense to. 46% of Dems in the rigged primaries “got it”, so it ain’t just me and there is hope for the Party. Have a nice day your silliness. Aren’t you a little on the mature end of life to be writing such petulant child retorts? In Attempt to Learn How Much Mueller Knows about Roger Stone’s “Collusion,”... Who Taught Trump about Weaponized Migration?